I heard one leader giving a christmas message that it was the wish of God that we should be together. ''Why did that same God who made the Isrealites to stay in Egypt for years as slaves also was the same God who told them to get up and match into their promised land. Now is the right time for Biafra and we mus get. THE VOICE OF THE BIAFRAN RABBI SAYS:'@IGBOKWE,IN BIAFRALAND,WE SPEAK A DIRECT TRUTH AND NAMELESS PATOR YOU REFUSED TO MENTION IS TUNDE BAKERE.BAKERE'S WORDS ARE NOT FROM GOD.TUNDE BAKERE OPPOSED GOD OF ISRAEL AFTER HE WAS ALLOWED TO SEE GOD'S PLAN FOR ZOO YET HE WENT AND CHALLENGED GOD BY ESTABLISHING 'SAVE NIGERIA GROUP'(SNG).TUNDE BAKERE BROUGHT GOD'S ANGER TO HIMSELF AND IF NOT FOR THE SAKE OF MANY SOULS UNDER HIM AND NAME OF GOD BEEN MOCKED,BAKERE WOULD HAVE BEEN A DEADMAN IN 2015. ALSO,UNKNOWN TO PASTOR TUNDE BAKERE IN ALL HIS FOOLISHNESS GOD USED HIM TO STRUCTURE AGREEMENTS OR ALLIANCE DOCUMENTS TO BRING IN MBUHARI FOR DIVINE PURPOSE OF BIAFRAN REPUBLIC.TUNDE BAKERE OPPOSED GOD IN BIAFRANS FREEDOM BUT WAS MADE BLIND TO ACT IN-LINE AND TODAY HE HAS REALIZED HIDDEN SECRETS OF GOD AND FALSE PROMISES AND THE WRONG SPIRIT NOW WORKING IN HIM.HE,BAKERE DID NOT EVEN UNDERSTAND WITH THE HOLY SPIRIT THAT THE OPERATION A DOCTOR PERFORMED WAS GOD'S ACT.THE SO-CALLED EAR UP AND DOWN MEANS NORTH AND SOUTHWEST WHILE THE OTHER EAR NOT SEEN BY HIM WAS AN OPERATED BIAFRAN REPUBLIC CARVED OUT OF NIGERIA.LET IT BE KNOWN TO ALL BIAFRANS THAT FALSEHOOD FROM SATAN SHALL COME FROM THESE YORUBA FALSE PROPHETS/TEACHERS/PASTORS ETC AND FEARS HAVE ENVELOPED ALL OF THEM CONCERNING THE REALITY OF BIAFRAN REPUBLIC.SO,BIAFRANS PLEASE FORGET ABOUT EVIL FORCES WORKING THROUGH FEARS AS THE YORUBA POLITICIANS,CLERGIES,TRADITIONALISTS ETC ARE JITTERY AND COLLAPSING AS BIAFRANS ARE LEAVING YORUBAS BEHIND IN ONE -ZOO-NIGERIA. 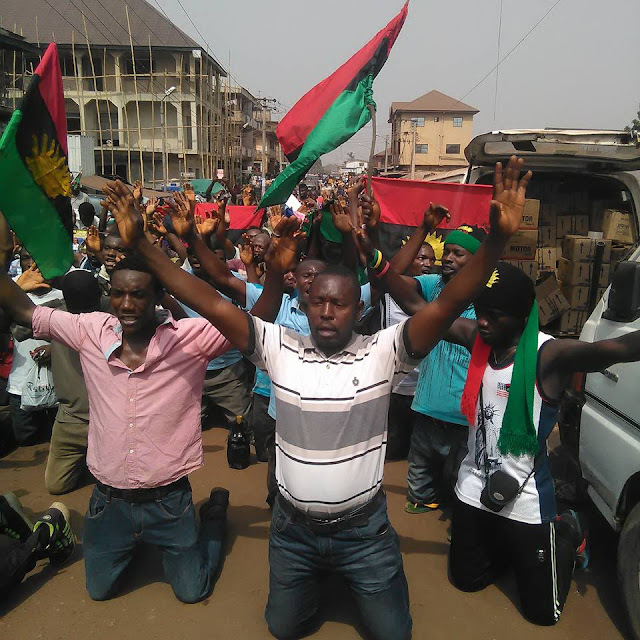 BIAFRA LIVES!! URS THE BIAFRAN RABBI.